The primary benefit of hair removal creams is the elimination of unwanted bodily or facial hair. But what makes a depilatory the best choice compared to other methods? Consumers look for cheap and easy solutions for just about any dilemma. This includes hair removal. But when it comes to hair removal creams, a budget-friendly and efficient solution is in place. Prices for cream depilatories and hair removers range from USD 4 to 15. There is little difficulty finding an affordable option. If you choose a cream that works well for you, the problem is easily solved. The critical component of the hair structure called keratin is a protein. This makes up between 65 and 95 percent of the hair’s total fiber as per weight and makes hair strong. The internal structure of the hair is the cortex which exercises control over the keratin. A thioglycolic acid compound is a popular ingredient used in hair-removal creams. It is found in salts like sodium thioglycolate and calcium thioglycolate. This has a strong and decisive smell. TGA present in the hair remover destroys keratin’s structure to weaken and dissolve hair. Consequently, it can be removed by wiping from the follicle, just beneath the surface of the skin. The upper layer of the skin contains the keratin. This is the reason hair-removal creams should not be used for longer lengths of time on the skin, without adding moisturizers or other healing agents. But if the hair removal cream is enriched with nutrients (as these most commonly are), it becomes easy to have this amazing cure for coping with skin hair troubles. The most basic advantage of the hair removal cream is that depilatory creams offer benefits that no other method can hope to attain. This includes a pain-free method of hair elimination which ensures that it is pain-free and the skin has zero side effects or reactions. Other methods of daily hair removal such as shaving require using a blade and the growth of hair is also very fast. Depilatories remove hair below the surface of the skin for results to be more long lasting, depending on the areas the hair is located in and the growth cycle length. Common side effects of shaving include razor bumps. You can easily avoid these through depilatory creams. Hair removal creams work fast within four to eight minutes and are easier to use, with no other skill other than following instructions. Waxing, tweezers or epilators are all costly and need some amount of training or skill to be useful. Additionally, hair removal creams do not need costly or major outlay. 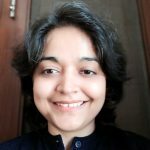 This budget-friendly hair removals solution is enough for multiple treatments, Other methods like threading and tweezing are not suitable for large areas and not as versatile as creams. Waxing is a costly process and shaving also entails expenditure in the form of blades, shaving creams, foam, aftershaves etc. Additionally, epilators, home lasers and so on require huge initial expense and they may need replacement parts too. Home removal creams are not messy and can be used to remove hair in methods. Hair removal creams in the form of roll-on, rub on and gel forms are perfect for clearing up the skin. Hair-removal creams have an additional benefit. When they are used to rub off cream and hair, your skin also becomes exfoliated. Exfoliation or removal of dead skin cells is the perfect way to remove dead cells that build up on the surface of the skin. When the hair cream is used, new cells are exposed. Additionally, an added benefit of hair removal creams is that the chemicals reach the skin and remove hair from just beneath its surface. Feeling a stubble becomes less than possible soon and users of hair removal creams spend less time than waxing with the same results. Hair creams can also slow down growth in impacted areas according to research. Whether you want to eliminate hair due to beauty needs or utility, hair removal creams are the best bet. Hair removal is a must for athletes and models alike! Eliminate undesirable hair without pain or stubble. A gentle cream dissolves hair below the surface of the skin. Sally Hansen is known for nail polishes and removers. But this beauty brand is best known for its hair removal creams which eliminate undesirable hair without pain or stubble-formation. The gentle cream dissolves hair below the surface of the skin, leaving the face free of hair and radiant as can be. This special kit also includes a bottle of Vitamin E lotion and collagen to soften and smoothen the skin once the hair is removed. This hair removal kit promises to remove hair without stubble or pain. It also has a gentle cream that dissolves hair below the surface of the skin. Exclusive collagen and vitamin E soothes and softens the skin. This fresh and improved hair remover offers clean, a new scent, a moisturizing formula for gently removing hair and enriched with vitamin E to smoothen the skin once the hair has been removed from it. It also comes imbued with pumpkin-seed extracts and willow herb which prevents the growth of hair. It is tested dermatologically and in salons too. The Sally Hansen creme hair remover contains EAU/water/aqua as well as mineral oil. It also contains calcium hydroxide, calcium thioglycolate, and Cetearyl alcohol. The hair removal cream also contains sodium silicate, stereath-30, Tocopheryl Acetate, ceteth-10, aloe leaf juice, Bisabolol, cetyl alcohol, alcohol denat, dipotassium glycyrrhizinate, potassium hydroxide, prunus amerniaca or apricot’s kernel oil, pumpkin seed extract, chamomile Recutita, farnesol, Serenoa serrulate fruit extract, Epilobium Angustifolium extract, potassium sorbate, sodium benzoate and citric acid. It also contains a conditioning lotion apart from this rich in soluble collagen, mineral oil, propylene glycol, and palmitic acid among others. d to smoothen the skin. Additionally, this kit contains pumpkin seed extracts, willow herb, collagen, and pumpkin seed apart from being vitamin E enriched. The vanilla scent is the top choice for users too. It has a safe formula for using on facial and other sensitive areas without any issues. It does not lead to irritation and contains both vitamin E and collagen. It removes hair extremely easily and has a fast hair dissolving formula. It goes through the inner layer of the skin and kills hair stubble on the surface. Rich in pumpkin seed extract, it stops the rapid growth of hair. This kit also comes with a conditioning lotion that moisturizes and hydrates the skin, leaving it glowing and soft. Its mild vanilla scent is better than that of other creams. It is a gentle hair remover which works well without causing stubble or pain. It soothes and softens the skin through its combination of collagen and vitamin E.
It comes with a nourishing aftercare lotion and is perfect for rough or coarse hair. This hair removal cream can leave hair on the joints. It needs to be reapplied to certain places to get out all the strands sometimes. It can also burn the skin, leaving red patches and an unpleasant smell. This Sally Hansen hair removal cream is the perfect choice for removing hair in an easy, pain-free manner without causing any problems whatsoever. It is ideal for sensitive skin too. 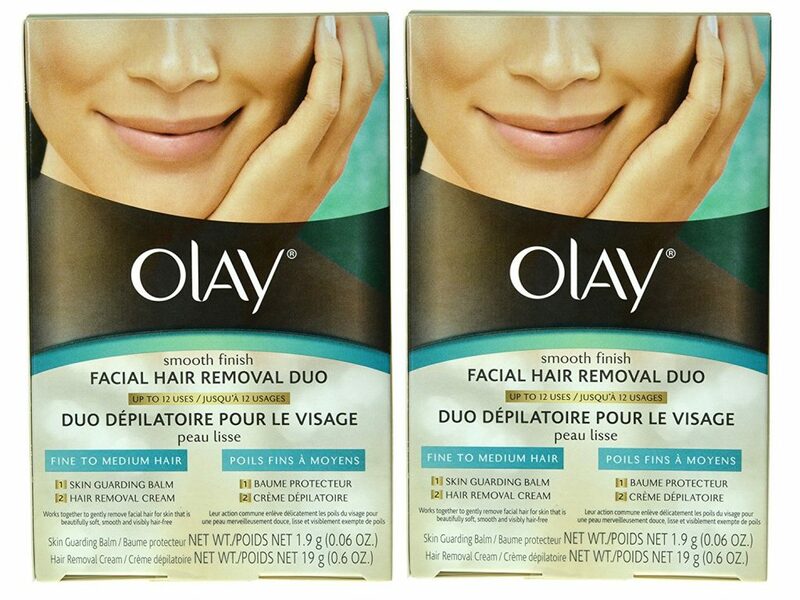 Olay hair remover is counted as one of the top-rated beauty products, getting awesome reviews online. It also comes with a hair removal cream and a skin protection balm that work in tandem to remove unwanted, stubborn hair from the chin, cheek, jaw and upper lip areas. The skin balm prepares and conditions the skin, making it easier to overcome irritation. It is perfect for zero redness and countering sensitivity in the skin. This hair removal cream has been dermatologically tested using a two-step system to offer a smooth finish ideal for hair removal treatments every week or frequently. The system takes only six to eight minutes to complete, leaving the smooth and hair-free skin. This Olay hair removal cream promises smooth, visible hairless skin and supple feel to touch. It also claims to be dermatologically tested. It works through a specially formulated two-step system designed to remove the fine to a moderate facial hair on the jawline and upper lip while lowering irritation. It promises hair-free skin in just under eight minutes. The hair removal cream contains water, mineral oil, Cetearyl alcohol, calcium hydroxide, calcium thioglycolate hydroxide, calcium hydroxide, chamomile flower extract, aloe leaf juice, perfume, cetearreth-20. The balm comes with poly cottonseed date, Brassica campestris oil, beeswax, ozokerite, ethylene brassy late, tocopherol, propyl gallate, and tocopherol acetate. This Olay hair removal cream considered one of the top beauty products when it comes to online reviews, rating, and testimonials. It is a two-in-one cure for persistent hair and works round the clock to provide flawless, glowing skin on the face. It can be used on the cheeks, chin, jaw-line and upper lips as well. The skin guarding balm should be followed by the hair remover for the best results. It needs to be used for only 6-8 minutes for the best results. It takes longer to remove facial hair. Can cause skin discoloration too. Olay is a brand that is synonymous with amazing skin quality and an all-rounder when it comes to hair removal for sensitive skin. This is why this hair removal cream along with the skin protection balm is the perfect choice for those looking for a hair remover that offers value for money. This Veet hair cream is considered an all-rounder when it comes to hair removal for sensitive skin. It offers complete protection from unwanted body and leg hair as well. It has a slightly better smell compared to other hair removal creams. This Veet hair removal smooth skin inducing hair removal cream gives effects that last twice as long as shaving. Unlike shaving, this formula skin hair removal cream works to moisturize the skin. It works to impact the roots of the hair, so hair strands take longer to grow back and skin stays smooth longer. This sensitive formula is specially designed with Vitamin E and Aloe Vera, making it perfect for chin, cheeks and upper lips too. 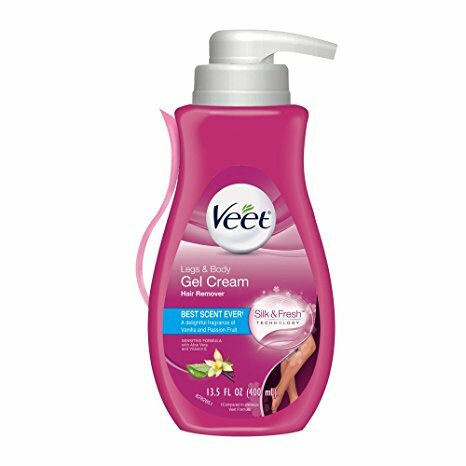 Veet also claims that this formula can be used in the shower quite easily. This Veet hair removal cream is aqua based. It also contains urea, Cetearyl alcohol, potassium thioglycolate, calcium hydroxide, glycerin sorbitol, perfume, magnesium trisilicate, talc, Ceteareth-20, Lithium Magnesium, Sodium Gluconate, Sodium silicate, tocopheryl acetate, aloe leaf juice, and a host of other beneficial nutrients for the skin. Veet is considered one of the leading manufacturers of hair removal products for women, with around 8 decades of experience in the field. This sensitive formula caters to all hair removal needs. It eliminated unwanted hair in just five or six minutes. It can be used for removing hair on the knees, arms, ankles, legs, underarms and bikini line. It also ensures that the skin remains hydrated and dermatologically tested. This hair removal cream has a formula suited for sensitive skin types. It also dissolves the roots and stops hair growth for a long time. It causes redness sometimes. It may burn or cause a rash if left on for long. People with sensitive skin complain about a sensation of tingling on the skin once this is applied. This fast working hair removal cream gets rid of unwanted hair in under 5 minutes and it is easy to use. It eliminates pain and irritation caused by harsh hair removal creams. In other words, it is the ideal purchase for hair removal from sensitive skin types. 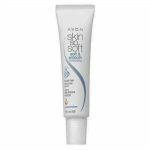 This Avon Skin So Soft cream is an inexpensive solution that meets all the hair removal needs. It works well and is simple and easy to use. It also comes with an affordable price tag. The main issue with this cream, however, according to its critics, is the strong smell. On the positive side, this hair removal cream is enriched with shea butter and meadowfoam oil. It leaves the skin soft and works rapidly to eliminate unwanted hair. Avon’s Skin So Soft makes it easy to remove unwanted hair with facial hair removal creams. This formula contains allow and meadowfoam oil for maximum sensitivity to the skin. It easily eliminates facial hair without problems while moisturizing and smoothening the skin. The tube contains 1 fl oz of the product. This hair removal cream is also fragrance-free and leaves skin clean and smooth. contains meadowfoam oil and removes undesirable facial hair. 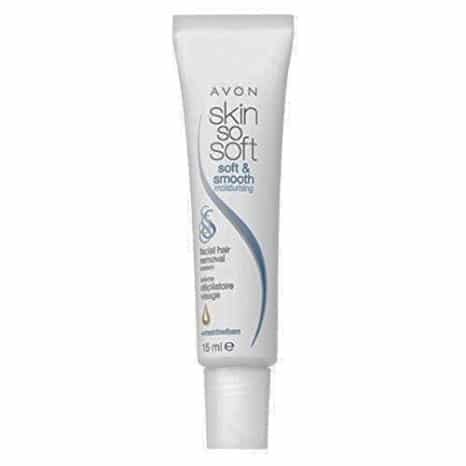 This Avon cream comes in 1 oz or 30 ml full size. It is a fragrance-free formula enriched with meadowfoam oil and aloe as well as shea butter. my formula. This skin bikini line hair removal cream is specially designed for sensitive skin and has garnered many positive reviews. It is not efficient when it comes to hair removal for other skin types. It can also cause skin irritation and discoloration. This hair removal cream works for not just the face, but other areas as well. It removes hair effectively and in a pain-free manner and comes with an amazing scent and affordable pricing to boot. This Nad hair remover comes with soothing chamomile extract and honey. The result is super soft skin and easy hair removal. This cream works well as against in-show exfoliating hair removers. It eliminates hair from legs, underarms, arms and the bikini line in just under 4 minutes. This is a natural hair removal cream, which offers the perfect cure for sensitive skin and armpit hair. It works well as a home hair removal cream for sensitive skin. Designed for painless hair extraction, it contains melon, avocado oil, aloe, and honey to smoothen and protect the sensitive skin. It also targets the hair shaft for removal of unwanted hair in just under 4 minutes. The new odor elimination technology makes the hair removal experience super amazing and easy. 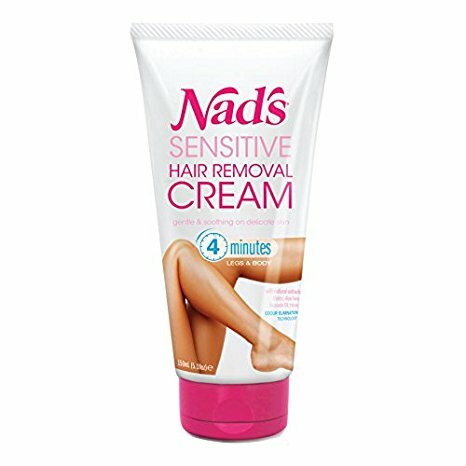 This Nad hair removal cream contains water, potassium thioglycolate, aloe leaf juice, urea, Cetearyl alcohol, ceteareth-20, glyceryl stearate, glycerin, calcium hydroxide, avocado oil, shea butter, Mel honey, melon fruit extract, and chamomile extract. It also is perfumed and contains a vast number of nutrients. Users rate this precision hair remover for sensitive skin highlight. This pain-free facial cream has been designed for sensitive skin using calendula oil and almond oil to form a skin barrier that is protective. The angle tip applicator ensures the right coverage and it takes just 4 minutes to remove the hair. The users also found the bonus of a soothing face balm to offer amazing advantages. Nad’s has also got hair removal cream kits for men and women, in addition to no heat wax gel hair removers. But this hair removal cream has the best audience reception. This is fairly effective for removal of unwanted hair. Can cause skin burn if left too long on. If you are fed up of shaving, waxing, threading, or other hair removal methods, this depilatory is the perfect answer for your personal grooming requirements and needs. It is simple to use, quick and less costly. It can effectively smoothen skin for more than a week. The first and most important step is to locate the perfect cream for your skin type. In case the cream is being used on the face and/or bikini line, the formula sensitive for the skin needs to be chosen. Choose the type of depilatory cream that works best from sprays, gels to aerosols and roll-on devices. If you are sensitive to odor, try a cream that has an additional scent. Check with the doctor, if you suffer from a sensitive skin condition, a skin problem or take medication that can impact your skin. As the proteins in the hair interact with chemicals that cut it down, and the skin also has protein, it can lead to a reaction if the doctor is not consulted in time. Check if you have rashes, hive or allergies to hair removers before. You also need to be alert if you have taken retinol, pimple or anti-acne medicine or others that impact the sensitivity of the skin. Also ascertain if you can use a hair remover if you have skin conditions like psoriasis, eczema, and rosacea. It is also important to perform a patch test 24 hours before trying the cream, as hormone levels fluctuate and causing the skin to undergo changes too. The skin’s chemistry may react to hair removers if you have never used it before. Therefore, it is important to test the area before applying the hair remover all over your body or your face. Check the skin for moles, scars, cuts, scrapes, cold sores, sunburnt or irritated skin. Cut down on the chances of having an adverse reaction to the cream and coping with a rash and/or chemical burn. Don’t carry out an application of the cream in areas where there are irritations or moles. Read the directions when it comes to the application the cream, as different products have differing instructions. While one type of hair-removal cream takes 3 minutes, another takes ten. Check the tube/bottle or company website to know more. Also, check the expiry of the cream before using it. Evenly apply the cream to prevent a problem when it comes to lack of uniform hair removal. Make sure the directions are followed. Remove the cream with a wet cloth or plastic spatula if necessary. Wipe it gently and do not rub the cream onto the skin. Then, rinse the area with lukewarm water (don’t use hot water as this can dry the skin). Ensure you do not remove the cream after a long time as this can cause a tingling sensation. Once the hair removal cream has been removed, apply moisturizer to hydrate the skin and wear cotton clothing after the cream. Also, do not scratch or rub the area. Make sure you observe the warnings such as avoiding tanning, swimming or sunbathing or using any fragrant or soap products within 24 hours after using the hair remover. The first consideration you need to take into account is the brand. Do you have a reputed and trusted brand at your side? This can make a real difference to the final outcomes. A top brand comes with a well-deserved reputation for excellence and quality outcomes. Checking the ingredients are also important, especially, if you suffer from skin allergies or conditions, as this can be a real problem if you have an aversion to the ingredients in the cream. Also check if natural products like aloe, honey, and shea butter are used to provide soft, smooth and supple skin. Budget-wise, you should be comfortable too. The price of the cream should be worth it. You should get value for money creams that offer add-ons like skin protection balms and lotions for the best results. Apart from the price considerations and the quality, also consider factors like whether the hair removal cream is waterproof, vitamin E enriched and more. At the end of the day, you need a hair removal cream that gives quick, pain-free and long-lasting results. For this purpose, it is essential to consider all the factors that come into play such as ingredients, quality, and impact on the skin. From patch tests to actually using the product, reviews can help you go the distance when it comes to attaining soft, supple, smooth, radiant and (most importantly) hair-free skin.